Call for volunteers at the Strait of Gibraltar! Migres Foundation is launching its 2013 call for researchers for the monitoring of migratory birds in the Strait of Gibraltar. Migres is a scientific programme for the long-term study and monitoring of migratory birds through the Strait of Gibraltar. Since 1997, Migres Programme is based on systematic and standardised bird counting which provides comparable results year after year. Furthermore, Migres actively contributes to environmental education and social awareness of bird and habitat conservation. This programme also aims to train those people interested in bird identification, census techniques and migratory bird studies. For this reason, we open this call to all those interested in our studies on migratory birds in the Strait of Gibraltar. The Italian peninsula is involved in an important migration flow. 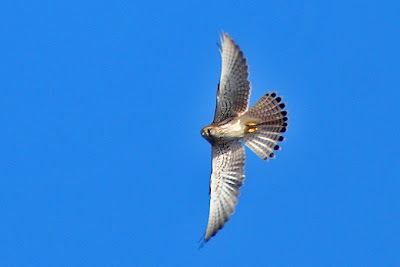 Lesser kestrels, Red-footed falcons and harriers are moving through southern Italy as observed in several sites of Calabria and Apulia. In the pictures below, taken by Matteo Caldarella, some migrating falcons close the Adriatic cost of Apulia. April is the month when many raptors start the breeding activities. In Central Italy Kestrels are occupying nests and laying their first eggs. The pictures below were taken in nest boxes in cultivated fields close to Rome. 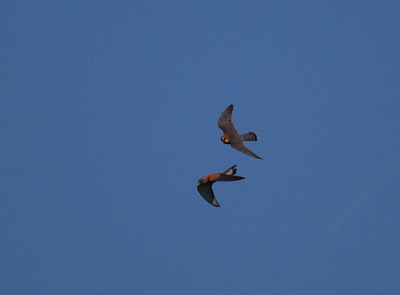 These are the last days to apply for the Grundtvig scholarship to participate at the training course on raptor migration research tecniques. THE DEADLINE TO SEND THE APPLICATION FOR SCHOLARSHIP IS ON APRIL THE 30. The course will be held next autumn (30 September - 4 October) in Pachino, Sicily. There is the chance to apply for scholarships provided from the UE (eligible: citizens of the 27 Member States of the EU with the exception of the Italian people, citizens of countries of the European Economic Area-EEA countries and of Candidate countries). Presentations will range among different topics of animal movement research using different methods (visual observations, long-term monitoring programs, radar tracking, GPS, GSM, GLS) and focusing their study on different aspect of bird migration (ecology, ethology, conservation, influence of climate change). Among the speakers Alejandro Onrubia (Fundacion Migres), Giacomo Dell'Omo (Ornis Italica) and the Medraptors staff. 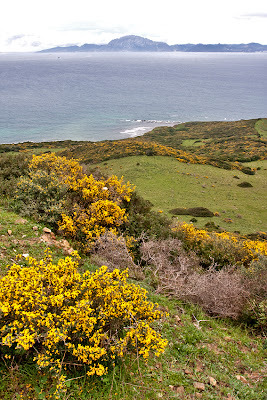 Moreover there will be the chance to visit some Important Bird Areas of south-east Sicily. 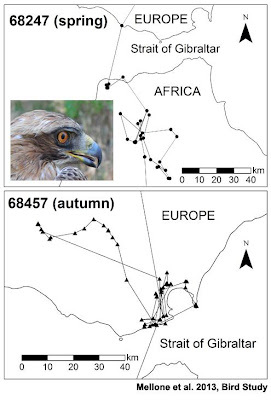 On Bird Study has been published a paper describing the migration and wintering of Booted Eagles belonging to the spanish population. This paper shows data from five eagles that were equipped with satellite transmitters. To read the paper click on the picture below. In these days many species of raptors are moving across the Mediterranean area, among them harriers, Kestrels and Lesser Kestrels. 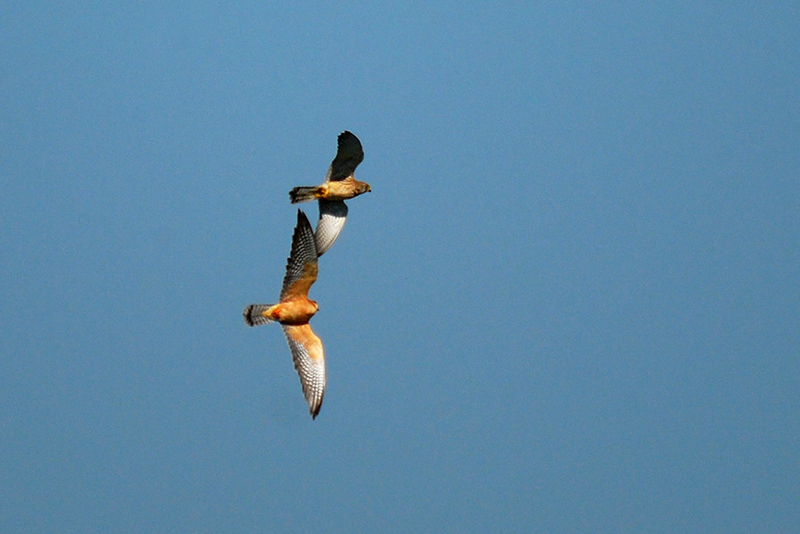 The Marsh Harrier shows a peak of migration between the last days of March and the first ten days of April. In particular several adult males are migrating in this moment. Moreover in the Venetian lowland there is still a passage of Common Buzzards moving toward North-East as observed some days ago by our friend Aldo Tonelli.